The 47.3 million dollar renovation currently undergoing Washington Park is progressing at a fantastic clip. Though all the general public normally sees is a green construction fence, make no mistake: improvements are happening, and it is already amazing to see what 3CDC has accomplished since closing the park last year. UrbanCincy had the opportunity to join a private tour of the park with the ArchNATI 2011 week. 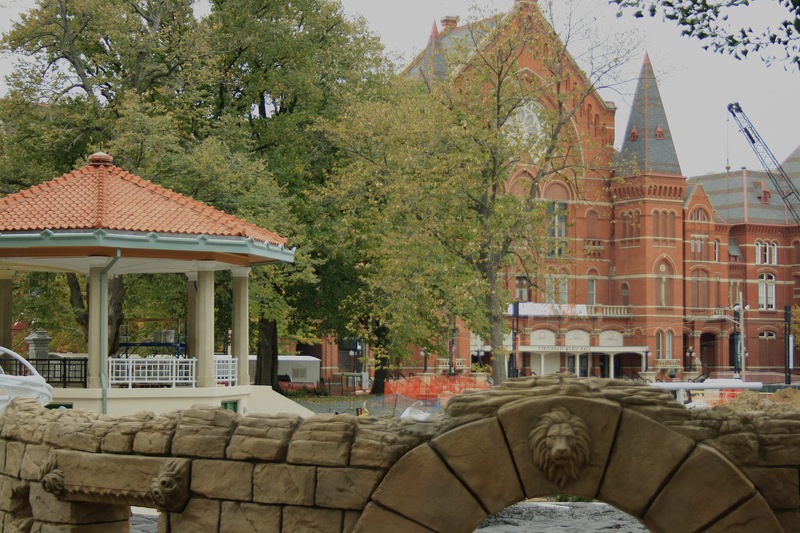 The updated park includes classic elements of the original greenspace that opened in 1855 – the bandstand is being restored, the original monuments are still intact, and a majority of the old trees stand tall – two of which will be highlighted and decorated in the winter months instead of bringing in a new tree a la Fountain Square. There are several green features incorporated into the park. “We (3CDC and the Parks Department) wanted to be cutting edge with our sustainable elements of the space,” said Jeff Martin, project manager and the tour guide for the event. “These features will save us money over time, and help the city as well.” Located in four locations of the park are “dry wells” – storage containers for excess rain water that will keep two million gallons of storm runoff out of the MSD system. The public restrooms are spacious and incorporate natural lighting with solar tubes – circular skylights that go through the roof and use reflective metal to bring sunlight into the space. All the new buildings in the park will have green roofs. The garage at Washington Park has been designed with light and safety in mind. 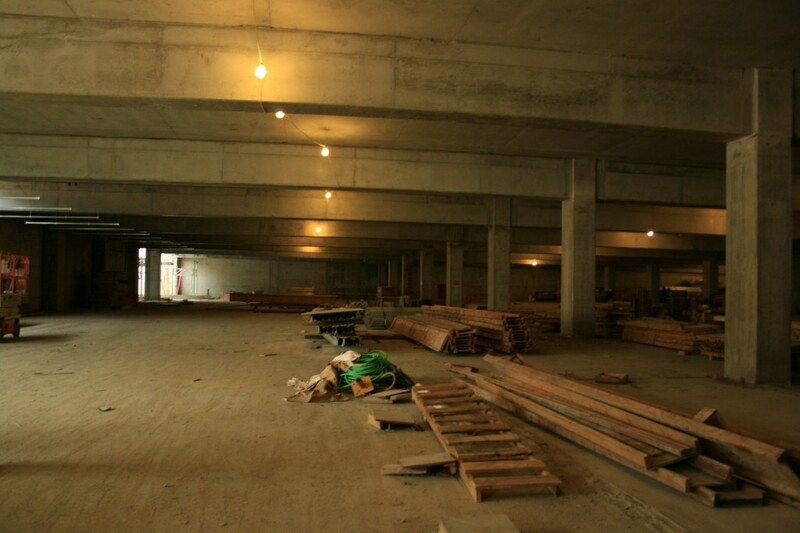 The 450-space parking garage has been designed with light and safety in mind. The three exits from the garage serve as light wells into the space, and are built twice as wide as normal stairwell allowances, encased in storefront glass to bring as much sunlight into the two level garage as possible. The bays of the structure inside are designed so that cars park at the level with the supporting columns, not next to them (like the Newport Levy garage) which creates better views for drivers and passengers getting out of their cars. New features of the park are progressing as well. The playground area has been designed specifically for the park, with play towers representing the water tower in Eden Park, and taking other cues from the historical architecture of the city. The dog park on the western end of the space incorporates special “pup-pea” gravel that will allow pups to do their business and keep the space looking and smelling fresh – there is also a small trough that runs through, allowing dogs to play and drink potable water. The football-field sized green space will soon have specialized sod laid down. The grass initially incorporates a synthetic structure in order for the root system to grow strong and remain springy for the public to run and play. It is the same system that the Cincinnati Reds use in their outfield, according to Martin. Check out the rest of the pictures below, and for more construction updates, you can follow the progress on the 3CDC website. Washington Park pictures by Jenny Kessler for UrbanCincy.